heaven of Charme. Lovers of nature, long walks and excellent cuisine find their ideal home at Su Gologone Hotel. In the heart of Sardinia, in the cool Supramonte countryside, wrapped in the ancient quietness of vineyards and olive groves, where the air smells of myrtle and rosemary. The Hotel Su Gologone is one of the legends of Sardinian hospitality and is absolutely very suggested for a romantic holiday. The charm of the Hotel Su Gologone, in the countryside of northern Sardinia, resides all in its unique blend of suggestive atmosphere, quality, service, comfort and tradition. In the green, silent park, the buildings are scattered amid gardens, arcades, courtyards and stone alleys shaded by lentisks, olive and medlar trees, next to a large swimming pool of spring water overlooking the soft, slivery horizons. 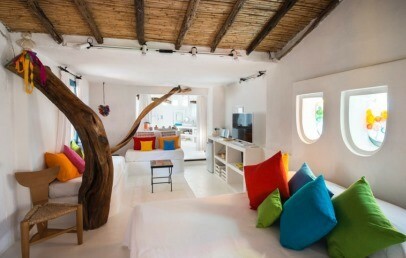 All rooms are comfortable and unique in its own style, as well as the different Junior Suites and fascinating Suites, also with whirlpool. The room characters are full of enchanting atmosphere, whitewashed walls, clear-blue wooden doors, antique furniture, traditional Sardinian fabrics and carpets, wooden chests, precious paintings, visible old beams of juniper wood... a real romantic refuge. In the lavish atmosphere of the restaurant Su Gologone, the guests are welcomed in front of a hundred-year-old fire-place, amid ancient farming tools, copper utensils and tableware, precious paintings and old ceramics; or, on a milder day, on the charming terrace frescoed by cascades of flowers. Each season has its own specialities. At the Hotel Su Gologone what once was reserved for special occasions only, can now be enjoyed every day. A rich heritage of gastronomic culture reinterpreted by employing exclusively products of the generous Oliena territory: bread and vegetables, meat, cheese, olive oil and wine. Here our guests can taste that expert hands knead, fold and unfold into dough, caskets of delights that unveil unique flavour to the palate. And roasts of meat made golden and succulent in the aromatic fire of the huge fire-place. And sweet temptations, innumerable short pastry and almond delicacies whose secret recipes are jealously kept. Here finally, the joy of the palate and that of the spirit are combined in a wine of great character: the Cannonau. Several restaurants and bars are available as well a nice spring water swimming pool with relaxing areas, bicycles, children’s playground, excursions on 4-wheelers, wellness treatments at the Spa, Art exhibitions, cooking classes, art & craft classes and a lot more, to fully satisfy your stay at the Su Gologone. Moreover at guests' disposal are a tennis court, mini soccer court, fitness area, mini golf. Pets are welcome, on request, with a supplement of approx. € 10 per day. 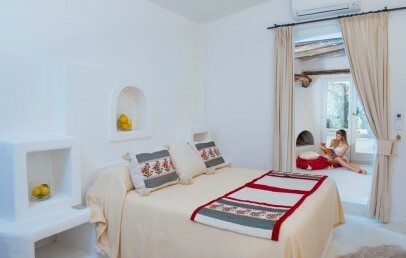 Double rooms, all difference each others and finest furnished. Elegant with their whitewashed walls and blue doors, fitted with antique furniture, traditional Sardinian fabrics and carpets, precious paintings and visible old beams of juniper wood. The bathroom has a shower. 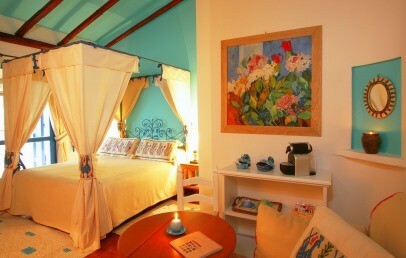 The Classic rooms are dipped in the garden and flourishing vegetation. Spacious double rooms with the possibility of 3rd bed (sofa bed) or baby bed on request. 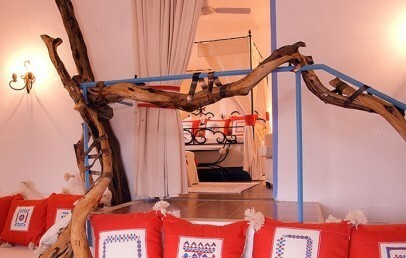 All rooms have furnishing, whitewashed walls and clear-blue doors, fitted with antique furniture, traditional Sardinian fabrics and carpets, precious paintings and visible old beams of juniper wood. The bathroom has a tub. 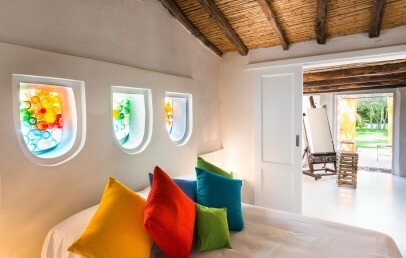 The Deluxe rooms have either garden view or view on the courtyard. 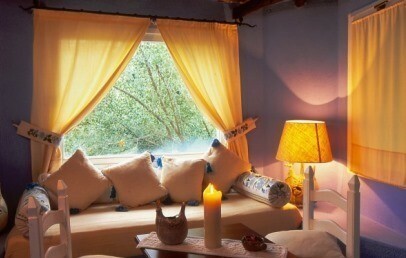 Suites for a romantic stay. 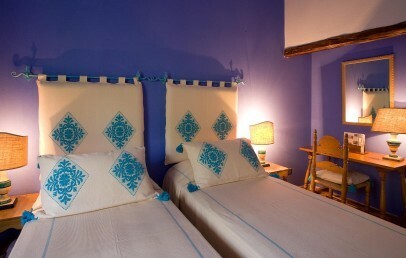 The double room and the living area are elegant with their whitewashed walls and clear-blue doors, fitted with antique furniture, traditional Sardinian fabrics and carpets, precious paintings and visible old beams of juniper wood, some have also a fireplace. The bathroom has a shower or tub. 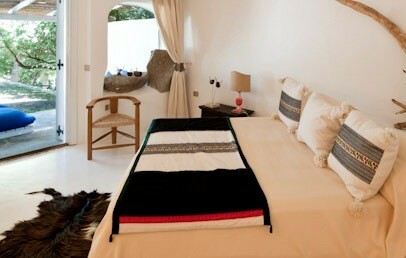 The Junior Suite are dipped in the garden and flourishing vegetation and have a nice balcony or terrace. Some have an outdoor pool, some have an indoor whirlpool. 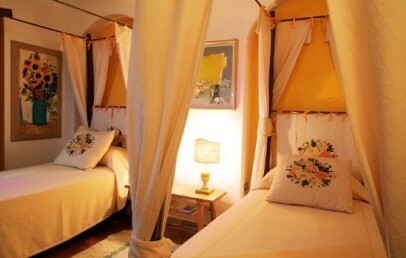 Very romantic Suites. A double room and the living room with whitewashed walls, fitted with antique furniture, traditional Sardinian fabrics, carpets, precious paintings and visible old beams of juniper wood. The bathroom has a shower. 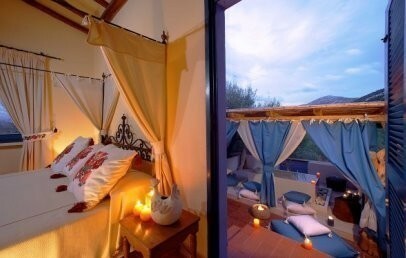 The Suites are located in the most panoramic area of the hotel and face either the mountains or the garden. 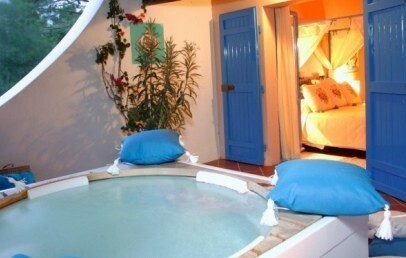 They have a terrace with a gazebo with a tub for two or a whirlpool in the room or a nice fireplace. Very inviting Suites in country style decorated with double bed, white resin floors, beams of juniper tree, traditional fabrics of the shepherd with old embroidery, leather and wool of Sardinia. The bathroom is equipped with every comfort with a shower and the terrace offers nice view on the surrounding mountains and has a tub for two with color-therapy function. 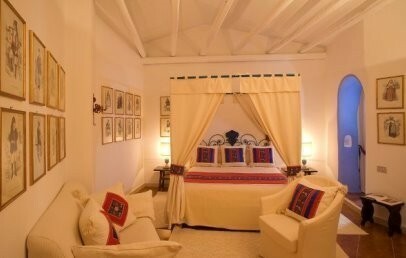 Romantic, spacious and exclusive Suites, all different from each other. 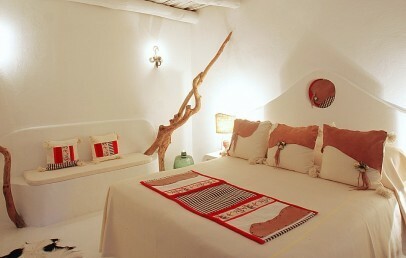 The sleeping area with baldachin bed and the living area are elegant in their whitewashed walls and clear-blue arches, comfortable furniture, traditional Sardinian fabrics and chests, precious paintings and profiled by old beams of juniper wood. The bathroom has a Jacuzzi tub and all necessary amenities. The Executive Suites are located in the most panoramic area of the hotel with a large terrace with a splendid mountains view. This accommodation has two interconnecting rooms, one lovely Suite and one Deluxe room. 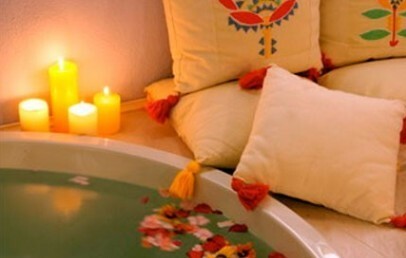 Each room has its own bath and comfort. 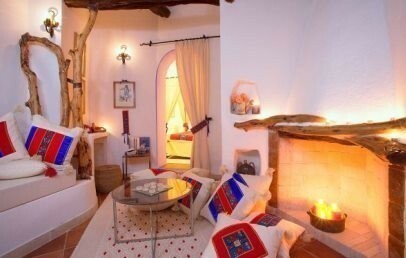 They are decorated in a typical handcraft Sardinian modern Style with whitewashed walls and traditional Sardinian fabrics and chests, precious paintings and profiled by old beams of juniper wood; some have also a fireplace. The bathroom of the Suite has a shower and a tub and the bathroom of the Deluxe room has a shower or a tub. The view goes out on the countryside or the garden that surrounds the hotel. 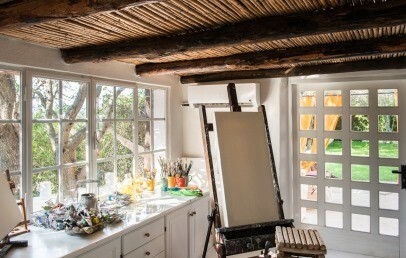 An idyllic, inspiring accommodation, dedicated to artists who wish to create. 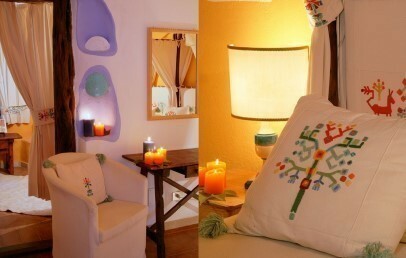 The Suite Art Studio offers a sleeping area with sliding door that separates the art studio and a bathroom with shower. There are canvases, brushes, paper at disposal. Further there is a 40'' TV, free Wi-Fi connection, CD player and IPad, Nespresso coffee machine, iron and ironing board, beach bag with sunscreen, towel, straw hat. 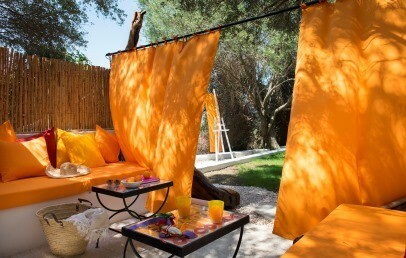 The inviting private garden with a veranda, a sun terrace, hammock and shaded area. On request are 24 hrs. butler service, babysitting, romantic candlelit dinner and also the possibility for your own exhibition.